If you are researching off campus, click on the Off Campus Access button in the upper-right corner of the library's website. When you see the white authentication screen, enter in your NDUS username (firstname.lastname) and password. 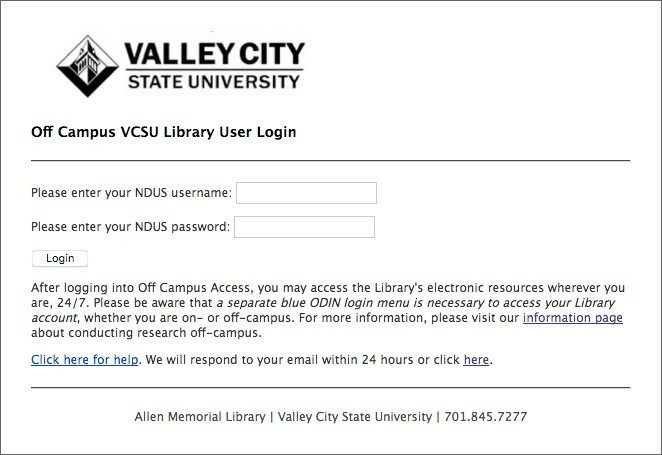 Note: The library is not able to provide your NDUS login information. If you do not know or need to change your password, please go to http://helpdesk.ndus.edu for self-service or call 1-866-457-6387 to speak to a NDUS HelpDesk representative. Next, you will be brought to a confirmation screen, where you can then proceed to the list of databases and find the one that you are looking for. Please note that Off Campus Access is necessary to take advantage of the Library's online resources from outside of the VCSU network. To access your Library Account, you will need to use a separate login sequence, which is explained below. Clear your browsing history. Depending on the browser you are using, this option will appear either in the Settings options, or History options. Change the browser (Firefox, Chrome, Safari, etc.) you are using to access our databases, and follow the steps above. Visit the Library's YouTube Channel for tutorials and tips about navigating our website, catalog, and databases. Contact the Library for additional assistance. 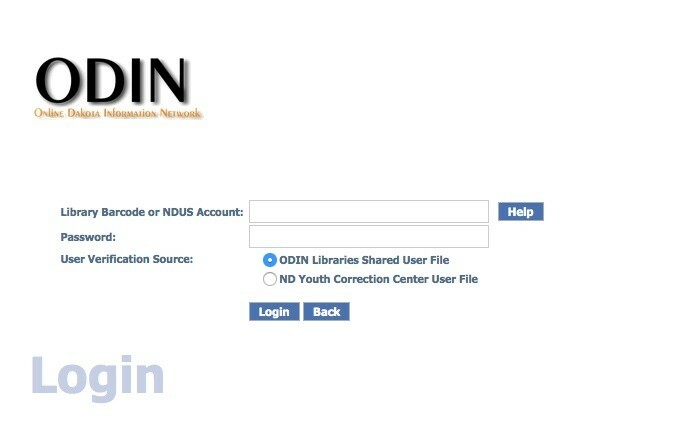 When you see the ODIN authentication screen, enter in your NDUS username (firstname.lastname) and password. You may use your account to view the items you have checked out, check the status of your ILL requests, and to maintain your favorite book and article selections in the catalog. For more information about the My Account feature, please visit our My Account Information Page.